Customers buy storage, not because of the type of technology it implements, flash or HDD, for example but because it solves their problems and is affordable. In the growing world of enterprise data storage, an innovative type of storage technology is making waves. Hybrid storage—the integration of flash, disk, and DRAM technologies—is proving to increase performance, speed, capacity, and affordability compared to traditional, standalone all disk systems or all flash systems. 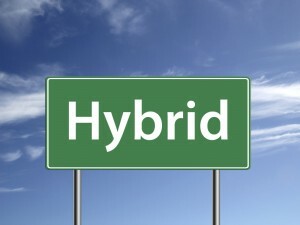 Without a hybrid system, any type of data storage has its downfalls. On its own, for example, flash is high-performing, but its trade-offs include limited life, slow writes, and a much higher cost compared to disk technology. Disk has the advantage of very low cost, but flash performance is most often better. Finally, DRAM is even faster than flash and has unlimited life, but it’s a drain on power and continues to be very expensive. Hybrid enterprise storage solutions create a system that combines the advantages of each data storage technology. In other words, that means an end to trade-offs and the beginning of data storage that has all the features you need. 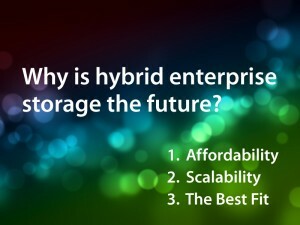 These are just a few of the reasons why hybrid data storage is the way of the future. The major downside of faster, high-performing storage technologies like DRAM and SSD is their cost. DRAM, for instance, is prohibitively expensive at scale, making it an illogical choice for most businesses looking for high-capacity, enterprise-class storage. Flash, while much cheaper than DRAM, still costs about twice as much as traditional disk technology. With a hybrid solution, disk is used for writes and long term storage while Flash is used for caching reads. By implementing the right balance of these technologies you can achieve maximum affordability, as well as performance. The smartest, most innovative enterprise storage solution is one that grows with your business., As the years roll by and technology continues to evolve, the world’s data storage needs will only grow. As a result, your business needs a flexible, scalable system capable of growing along with you. The versatile offerings of hybrid data storage—namely, high density infrastructure and low power consumption—ensure that there will be plenty of room for your future data storage needs. As I said above, a key attribute of any solution is its ability to solve the customer problem. A well-designed Hybrid data storage system allows your business to experience it all: high performance, scalable capacity, reliability, and affordability, without sacrificing one for another. At Infinidat, we don’t believe in trade-offs. The pros and cons of individual technologies may well become obsolete as we continue to optimize our ideal integration of technologies to solve customer problems and do it affordably. To learn more about how our innovative InfiniBox™ can bring affordable high-performance data storage to your enterprise, contact us today!